Date: Apr 4 2019, 3 p.m. - 10 p.m.
Come join MWR at the Lock & Dam Lounge for April's First Thursday Social. This month we'll be featuring a tap takeover by 5ive Cities Brewing out of Bettendorf, IA. Gather all your friends, family, co-workers, neighbors... whoever, it's open to the public and join us for live music from Jef Spradley, drink specials and FREE appetizers courtesy of our sponsor, the Rock Island Arsenal Chapter of the Association of the United States Army (AUSA). 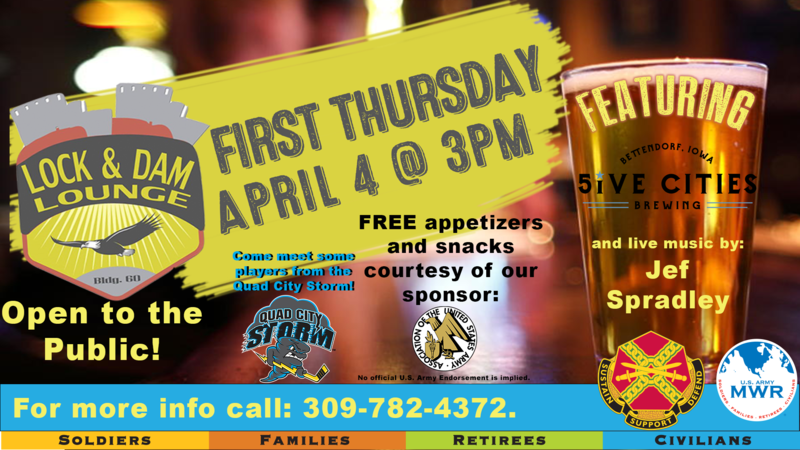 Also this month we'll have some of the Quad City Storm hockey team in attendance so come and meet some of the athletes on the Quad Cities' newest sports team! Call +1 (309) 782-4372 for more information.